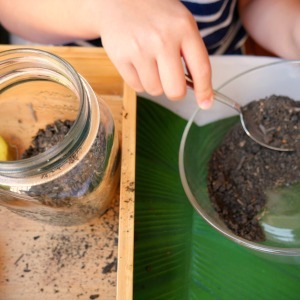 How to make learning about garden soil fun! 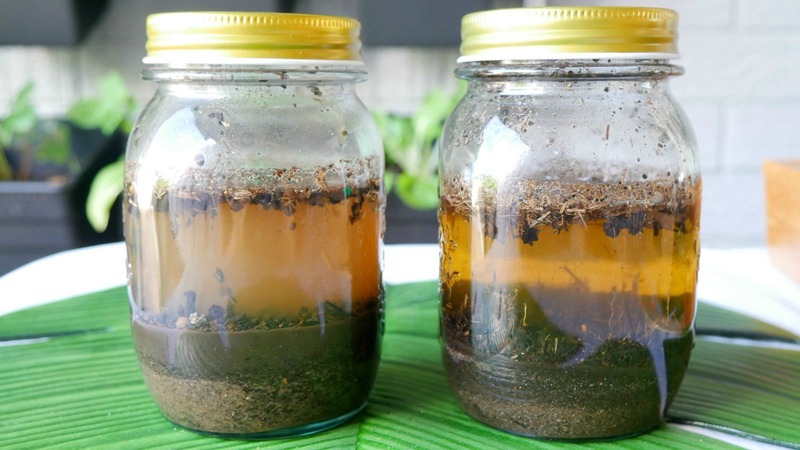 Soil testing is a way you can get to know your soil a bit better before you grow your plants. Organic gardening is all about working with nature to ensure your garden is free of chemicals and pesticides. One of the key principles of organic gardening is to ensure your soil holds everything it needs in order for your plants to grow strong and healthy. So many people miss this crucial step in gardening. They are not necessarily trying to skip it, they simply may not be aware of it, but you don’t need to be a horticultural expect to get this part right. 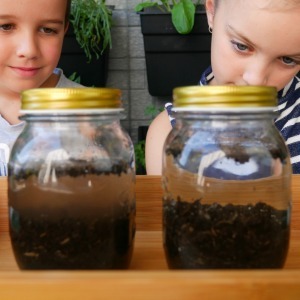 Testing your soil can be a simple job, and the kids can learn so much from it as well. We turned our testing into a garden science experiment which helped the kids conceptualise the importance of healthy soil. 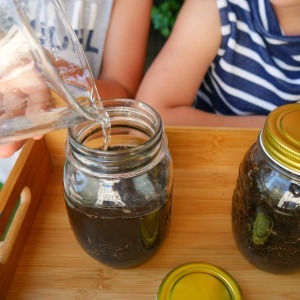 It’s easy enough to do, and it teaches kids the important role soil plays in the life of our plants. Your soil can be one of three types and most of the time it will be a combination of all of them. However, it’s the ratio of each that makes our soil ideal for growing plants, especially food. First, let’s dive into our three soil types. Clay soil has the benefit of retaining water, however, the downside of clay soil is that it is so condensed that it has no airflow and drains very slowly. You will notice your soil clumps together in large particles that you need to break up. Sometimes it’s so thick & wet you don’t seem to be able to even break it up. When it does dry out it cracks as well. Planting produce in soil that has too much clay could minimise your chances of success. We definitely don’t want this to happen. Sandy soil is almost at the opposite end of the scale, as it has too much airspace and the particles are very small so your soil will find it hard to retain moisture. As soon as your weather starts to warm up, sandy soil will dry out fast, and your plants will find it hard to maintain the water & retain nutrients from the soil which they need to grow. 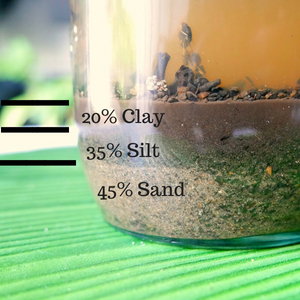 Silt, on the other hand, sits right in the middle of clay and sand in both size and performance. It can hold enough water but not too much; it will retain enough nutrients to benefit the plant’s growth and in Spring as the weather warms up the soil does as well but at a regulated speed. Silt is also referred to as ‘loam’ soil. An ideal healthy soil would have a composition of approximately 20% clay, 40% sand and 40% silt. 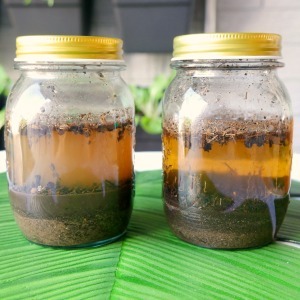 Collect 1 cup of soil for each experiment. 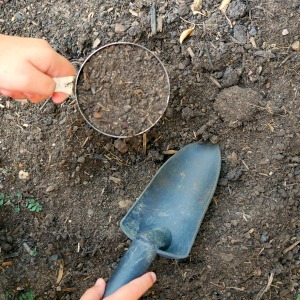 Remove large sticks, rocks, leaves and bark from the soil. 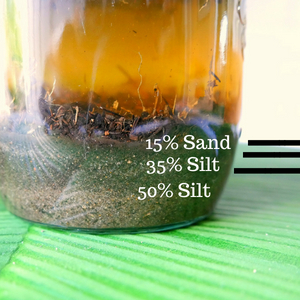 Add the cup of soil you collected to the jar. Then fill the jar with water and leave about 2 cm at the top. Shake for up to 5 min to ensure the soil is saturated. Leave to settle for approximately 24 hours. Soil A closely resemble the ideal soil which is 20% clay, 40% silt and 40% sand. Soil B could do with a little help. Different plants need different soil, but in general, your soil can be improved by adding some of the following, depending on what your results are. A wetting agent can help your soil retain moisture. Our young scientists had so much fun analysing the results and learning in our garden science lab. Healthy plants need rich soil to grow strong. Your soil can make a huge difference to your food garden and can be the difference between a bumper crop and a handful. You need to also have around 6-8 hours of sun a day and keep a water supply handy. Mulch around your plants to ensure the soil stays cool and retains some moisture, especially in the hot weather. Make sure you follow a planting guide as well, so you know what to grow in your climate. Practice organic gardening principles including pest control and keep your food garden chemical and pesticide free and you’ll be harvesting your produce in no time. We also have a list of the easiest veggies to grow to get you started.